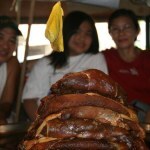 One of the best product that visitors can get from our town is the Pork Tapa also known as Tapang Taal. 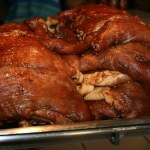 It is made of Pork, Soy Sauce, Garlic, and other ingredients that make it really tasty. There are lots of ways to cook Tapa. It can either be fried or grilled. 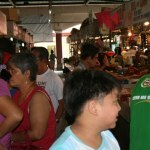 The Tapa can only be seen in the public market. 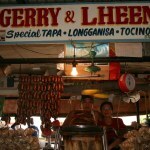 The above shown pictures are taken from the stall of Gerry and Lheen Special Tapa and Longanisa. For orders, customers may contact Gerry and Lheen Special Tapa and Longanisa as mentioned in the about page of this blog. How about a write-up/review of some restaurants in Taal? Ako nga rin every year ko lang natitikman ang tapa kasi OFW ako :).. Salamat for dropping by my parents site. 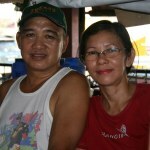 Tita, thanks po for visiting our blog. This is also a way to promote Tatay and Nanay’s Business in Taal. 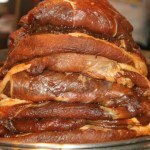 As well as letting other people know about the existence of Pork Tapa and Longanisa from our Town, Taal. God Bless din po Tita..
masarap talaga yan gawang batangas eh! !matagal na rin akong ndi nakakatikim nyan eh!taga laurel ako kaya lang dito na ko sa australia nakatira sa sydney wala ga kyong branch dine maggawa n kyo palagi na laang pampanga ang natitikman eh ka tam -is naman eh iba yang gawa sa atin!!! masarap talaga ang Tapang Taal. da best! Now, i know where to go to the next time I visit Taal, Gerry and Lheen! Hi Dex, gaano kalayo yan from the Plaza? sayang talaga sana noon ko pa nakita tong site mo! hi, im a HRM student from batangas state university,..
saan, po pd mag-interview..this is 4 our research topic which is “The Assessment of Collection of original recipes of food delicacies found in selected town and cities of Batangas.” and Taal will be our first stop. tnx and godbless!!!!! Pede po mahinge ang recipe ng tapang Taal? Thanks and god bless sa business nyo.. Nandto po ako sa Jacksonville Florida USA. 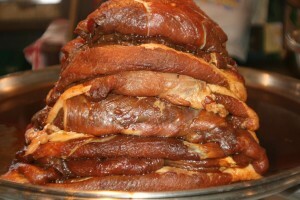 My wife is from Taal, Batangas, I can say that Longganisang Taal is one of the best tasting longganisa I had tasted. I never missed buying a kilo or two whenever we visit my inlaws in Taal. You should try it and Im sure that you will love it. best for breakfast with sinangag and hot chocolate. Sorry but it is one of the secret that has been kept from different generation..
Hello, Thanks also for visiting my site. I saw your blog by searching for recent blogs about Taal Batangas and hoping to promote our very own Tapang Taal. 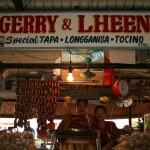 Hope you could visit my parents stall ( Gerry and Lheen Special Tapa and Longganisa ) on your next visit in Taal. And hoping you could also blog about it :). Again thanks for your visit. Greetings from your Kapuso Network! MIDNIGHT SNACK is a food segment that airs every Monday -Thursday, 11 pm on GMA news program “SAKSI”. This segment features the country’s top meals, hosted by Mikael Daez. We are currently producing the segment entitled “tapang taal”. In line with this, we would like to ask permission from your good office to allow us to shoot your complete establishment with complete set-up, cooking process, food shots, and let our host taste the said food as part of his segment. The shoot will be done tomorrow, September 7,Saturday and it will only take maximum of 3 hours, although we request to have time allowance just in case there might be schedule changes and for travel time difficulties. The team will be composed of our host, executive producer together with our cameraman and assistant cameraman. We do apologize for the short notice. We will have with us a Professional handheld camera, tripod and audio equipment. Should you have inquiries regarding this matter, please feel free to call us at 982-7777 loc 1410 or call me directly at my mobile number, 0906-522-1387. Thank you and may God continue to bless you and your family! 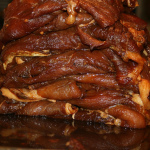 Where can I find the best tapa, embutido and tablea in Taal, Batangas? My husband has been looking forward to eating his Grandma’s dishes when he was a kid. He wasn’t able to eat it when his Grandma died. I wanted to make him happy especially he misses his Grandma so much. Sir/mam ask q lang po pwde po umangkat sa nyo ng tapa…how mich po ang killo ng tapang baboy?